Marc Jacobs has entered the world of cosmetics with Sephora, which makes you wonder why the American fashion designer and creative director of the French design house Louis Vuitton waited so long. The Marc Jacobs Beauty collection debuted at Sephora (which is owned by Louis Vuitton and Moet Hennessy) on August 9th and will be availabe exclusively at Sephora, on Sephora.com and in select Marc Jacobs stores. 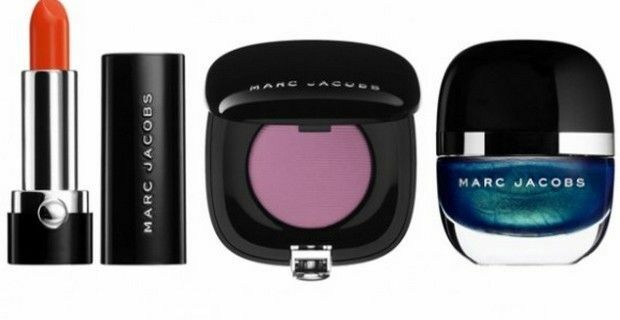 The Marc Jacobs Beauty collection is simply huge, so you can fill up your makeup bag, from foundations and concealers to colorful lipsticks, blushes, eye shadows and nail polishes. The collection is basically divided into Smart Complexion, Blacquer , Color-Full and Boy Tested. Girl Approved. lines. Smart Complexion are foundations, and include the Genius Gel Super-Charged Foundation which is antiaging, long-wearing and is available in 16 versatile shades and the Perfection Powder Featherweight Foundation comes in 10 shades, while the Remedy Concealer Pen, which is an all-in-one eraser, brightener, and corrector and comes in nine different shades. Blacquer is a very intense shade of black that was developed in Japan. This shade of black is found in the Magic Marc’er Precision Pen Eyeliner, the Lash Lifter Gel Volume Mascara and the Highliner -Gel Crayon, which also has other five fascinating shades. Hi-Per Color features Style Eye-Con with 3 or 7 pan palettes of colors , that are available in three finishes: metallics, mattes, and sheens. There’s also Lust for Lacquer Lip Vinyl in 12 hues and inspired by Marc’s favorite music and the Lovemarc Lip Gel which has 16 different shades. The Shameless Bold Blush is inspired by Jacob’s “shameless” tattoo, and these powder blushes are available in 9 shades. The O!mega Bronze Perfect is available in just one shade, Tantric, for both face and body. The Enamored Hi-Shine Lacquer nail polishes are inspired by Marc’s highly lacquered coffee table and the 24 wet look shades are based on Marc’s favorite movies. Boy Tested. Girl Approved line was personally tested by Jacobs and contains three personal essentials. The Lip Lock Moisture Balm that offers SPF 18 protection and is available in one shade. The Brow Tamer Grooming Gel that grooms, shapes, and holds your brows and the Remedy Concealer Pen that is part of the Smart Complexion collection.